Infrastructure Victoria has released a discussion paper for the development of a 30 year infrastructure strategy for Victoria. 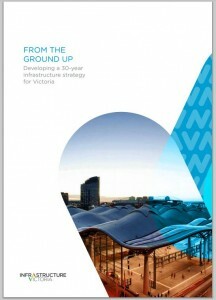 The paper is titled: From the Ground Up and is available on the Infrastructure Victoria website. You can provide comment on the paper by subscribing to the Consultation Register and you will be kept informed of progress in developing this strategy.